Ok folks… this one was really out of my element. I hear the phrase “chicken parm” and run in the opposite direction. 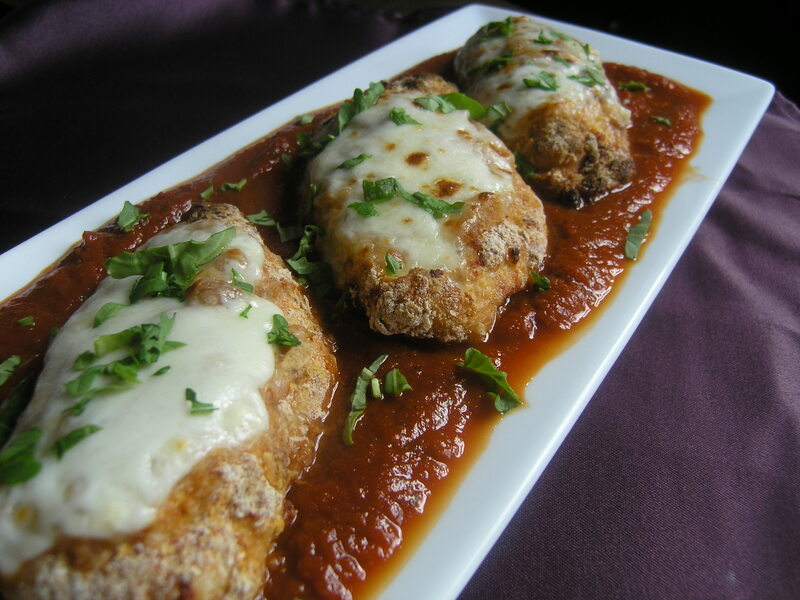 I’m always a little unsure if chicken parm is deep fried- it usually looks that way. Regardless, it’s definitely not healthy and for all the calories normally doesn’t taste that great. Ryan loves it. He loves every part of chicken parm from it’s crusty, fried exterior to it’s processed tomato sauce. He even ordered a chicken parmesan pizza a few weeks back. So when he was craving it for dinner last week and we actually had a night to cook, I thought I’d make the healthy rendition. Less calories, more nutrients, but most importantly… better taste. Nothing beats homemade marinara. It doesn’t take that long to make from scratch but is worlds better than the stuff in a jar. I find that sauces in a jar either lack the taste of fresh herbs or taste really sweet. Yuck. Canned tomatoes, lots of garlic, and fresh herbs are all it takes for a delicious marinara. People can tell the difference. If it seems too time intensive for your busy schedule, double or triple the quantity and freeze it for future dinners. Your Italian Nona would be proud. For the chicken: combine the bread crumbs, Parmesan cheese, and basil through chile flakes in a dish. Crack the eggs in a separate bowl and whisk. To bread the chicken, dip each of the pieces into the egg, coating on all sides. Transfer to the dry ingredients with one hand (the wet hand) and then coat all sides of the chicken with the dry ingredients with the other hand (dry hand). Complete this with all four pieces and place onto a cookie sheet. (Keeping one wet and one dry hand saves a big mess and also keeps the breading from bunching up). Bake in the oven for 20 minutes and remove from the oven. Flip the chicken to the other side, top with the fresh mozzarella, and cook for another 5-10 minutes or until the chicken is cooked through. While the chicken is cooking, make the marinara. Heat a medium soup pot on medium heat and drizzle with one tbs of olive oil. Add the onion and saute until it starts to caramelize. Add the garlic and the dried herbs; saute for another 2 minutes. Add the tomatoes, bring the mix to a boil, and reduce to a simmer. Cover and cook for 20 minutes, or until the chicken is done. Layer the marinara on the bottom of a dish and then the chicken. This keeps the chicken crispy and not soggy. Top with fresh basil.